That’s 11 steps…at least! I know, if you do it enough times you could probably get that down to a 15 minute setup, and that’s probably only if you have local versions of your boilerplate theme and plugins that you can quickly copy and paste into the respective directories. Remember in English class, how they told us to (1) say what you’re going to say, (2) say it, and then (3) say what you said. I always remember thinking, “That sounds redundant.” Well, I’m going to take a lesson from Mrs. Noble. I’ll tell you a little bit about the tools we’re going to put in our tool chest, then I’ll show you practically how to use them. It may get a little technical from time to time, but try to stick with it, it will be worth it. If we’re going to use it, we have to install it. Fortunately for us, this is easy. There’s a big green “install” button on their site. Click it. Sudo forces your computer to run the command as a super user. It will ask you to enter your computer’s password. For the longest time, I was uncomfortable inside the Terminal, too. But, I promise, the more you use it the more comfortable you’ll become. As soon as you see the benefits that the Terminal provides your workflow, it will eventually become something you can’t / won’t want to ignore. When you think of it in those terms, it makes sense to implement WordPress as a submodule. I don’t manage the WordPress core, so why not make it separate and reference the actual WordPress repo itself? This is the folder name for your theme. I’ll usually give it the same name as my project. I have my starter theme stored in a public GitHub repository. I have two different repositories depending on what framework I’m going to use on the project. If I’m using Zurb’s Foundation I use ahha-foundation. If I’m using Susy, then I have ahha-susy. Both of these are variations of Todd Motto’s HTML 5 Blank Starter Theme. The repository simply holds the theme folder, nothing more. — and like I said, these are public repositories, so you’re more than welcome to use them. I usually just delete the directory and run YeoPress again. Since, YeoPress is doing all the heavy lifting, it’s easier to run the script again than trying to run lines in the Terminal to fix it. I still have to go trough the WordPress install wizard is there a way to automate this? @lorenzonannings:disqus Are you talking about the WordPress 5 minute install? or the Yoman install questions? Can you automate the setup of WordPress using yoman? Yeah, so if you go through the Yoman setup above, when you try to pull up your WordPress site, you’ll skip WordPress’s 5 minute install, since it generates the wp-config.php file for you. You’ll still have to go through the admin panel and setup Permalinks, Time Zone, etc. but Yoman at least takes some of the steps out of the process. This looks super cool! Great post! (node:8444) [DEP0013] DeprecationWarning: Calling an asynchronous function without callback is deprecated. Were you able to get this figured out? It sounds like it might be an issue with Google Drive or with your profile? 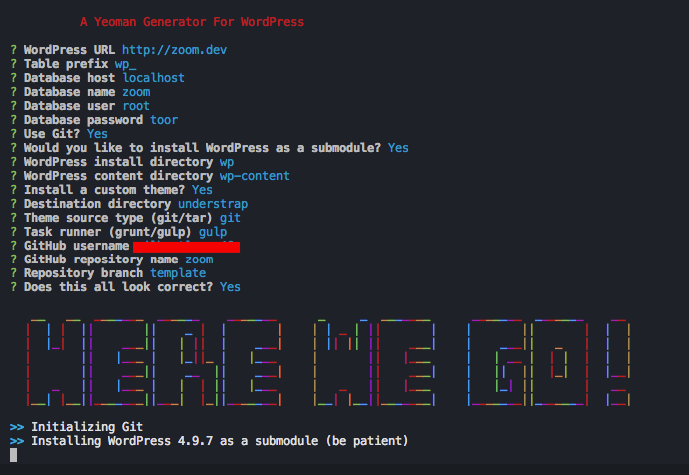 Have you tried running `yo wordpress` in another location? Nope, I installed it the old way, I’m new to WP and I’m worried I’ll have trouble syncing DB from local dev to production. I’ve never run into the error that you encountered, but when I Googled it, it seemed to suggest issues with Google Drive and the profile. It’s suspicious that the file path you listed includes Application Support. I still use `yo wordpress` to set up all my builds. Even though the repo hasn’t been updated in a while, there aren’t any features that I find lacking and it installs the most recent version of WordPress. https://uploads.disquscdn.com/images/bb7ef18cba3d7190a16628f12ed4e86508e1c97261bfd444490967af3982a786.png Amy (Haywood) Dutton does this workflow still works for you? I revisited you post because I have new wordpress project. @disqus_WIEtqn4Tct:disqus How long did you wait? Within the first minute, it should start scrolling through all the directories and files it’s creating. This is so incredibly stupid. You are just building in dependencies for the next developer who has to deal with your “application.” What happens when Yeoman goes out of favor? Keep it simple…! @disqus_smaqBbwyce:disqus The next developer doesn’t have to do anything with Yeoman. The project is not dependent on it. Yeoman simply handles the initial project setup on my end. It is simple. Next time you want to call something “incredibly stupid” it would be nice if you were familiar with the technology, first. Yo. I have worked with Yeoman. I still think this is stupid. WordPress takes so little time to set up you do not need a freakin scaffolding tool!. The issue is then developers will then go further and use a a dependency management tool after they do they do their Yeoman set up. Keep it simple. Use best practices.